Though the Apple Pay system will debut initially in the U.S. alone in October, Apple reportedly has plans in place to begin expand its mobile wallet service internationally to China through partner China UnionPay Co. Details on the alleged agreement were shared by an unnamed source with Beijing-based media group Caixin. UnionPay is a state-backed bank card association, and the company is said to have already reached an agreement to allow the Apple Pay system to link to its cards. Though the companies are said to have reached an agreement, it remains unknown exactly when Apple Pay could launch in the world's most populous nation. As of now, it's not even known when the company's next-generation iPhone 6 and iPhone 6 Plus, which are required for NFC-based Apple Pay, will debut in China. Last year, the iPhone 5s and iPhone 5c debuted in mainland China on the same day as a host of other major markets, including the U.S. But this year, Apple reportedly hit an internal delay thanks to regulatory approval requirements in the country. The iPhone 6 and iPhone 6 Plus will debut in the U.S. and 8 other countries next Friday, Sept. 19. The other launch locations are Hong Kong, Singapore, Japan, Australia, Canada, the U.K., France, and Germany. 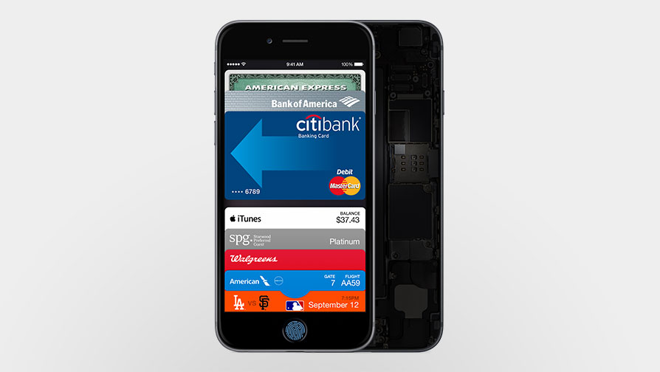 Apple Pay is a Touch ID-based secure mobile wallet from Apple that will be included with the iPhone 6 and iPhone 6 Plus. It will not be compatible with previous-generation handsets because it requires near-field communications technology embedded in Apple's latest devices. The Apple Pay system is scheduled to launch in the U.S. in October with a software update for the iPhone 6 and iPhone 6 Plus. Apple has said it plans to launch its system in more countries soon, but hasn't given a timetable for global rollout. In the U.S., Apple has partnered with American Express, MasterCard and Visa for digital debit cards and credit cards. In addition, the six biggest issuing banks in the U.S. are on board, representing 83 percent of credit card volume in America.